Turkey’s Muslim Brotherhood-friendly Foreign Minister, the inscrutable Ahmet Davutoglu, is the government’s main architect of Turkey’s self-defeating strategy of toppling its former ally Bashar Al-Assad in Syria. According to one report since 2006 under the government of Islamist Sunni Prime Minister Recep Tayyip Erdoğan and his pro-Brotherhood AKP party, Turkey has become a new center for the Global Muslim Brotherhood. A well-informed Istanbul source relates the report that before the last Turkish elections, Erdogan’s AKP received a “donation” of $10 billion from the Saudi monarchy, the heart of world jihadist Salafism under the strict fundamentalist cloak of Wahabism. Since the 1950’s when the CIA brought leading members in exile of the Egyptian Muslim Brotherhood to Saudi Arabia there has been a fusion between the Saudi brand of Wahabism and the aggressive jihadist fundamentalism of the Brotherhood. The Turkish response to the single Syrian mortar shell, which was met with an immediate Syrian apology for the incident, borders on a full-scale war between two nations which until last year were historically, culturally, economically and even in religious terms, closest of allies. That war danger is ever more serious. Turkey is a full member of NATO whose charter explicitly states, an attack against one NATO state is an attack against all. The fact that nuclear-armed Russia and China both have made defense of the Syrian Bashar al-Assad regime a strategic priority puts the specter of a World War closer than most of us would like to imagine. NATO is already clandestinely engaged in the Syrian conflict, with Turkey taking the lead as U.S. proxy. Ankara’s foreign minister, Ahmet Davutoglu, has openly admitted that his country is prepared to invade as soon as there is agreement among the Western allies to do so. The intervention would be based on humanitarian principles, to defend the civilian population based on the “responsibility to protect” doctrine that was invoked to justify Libya. Turkish sources suggest that intervention would start with creation of a buffer zone along the Turkish-Syrian border and then be expanded. Aleppo, Syria’s largest and most cosmopolitan city, would be the crown jewel targeted by liberation forces. Unmarked NATO warplanes are arriving at Turkish military bases close to Iskenderum on the Syrian border, delivering weapons from the late Muammar Gaddafi’s arsenals as well as volunteers from the Libyan Transitional National Council who are experienced in pitting local volunteers against trained soldiers, a skill they acquired confronting Gaddafi’s army. Iskenderum is also the seat of the Free Syrian Army, the armed wing of the Syrian National Council. French and British special forces trainers are on the ground, assisting the Syrian rebels while the CIA and U.S. Spec Ops are providing communications equipment and intelligence to assist the rebel cause, enabling the fighters to avoid concentrations of Syrian soldiers. Little noted was the fact that at the same day as Turkey launched her over-proportional response in the form of a military attack on Syrian territory, one which was still ongoing as of this writing, the Israeli Defense Forces (IDF) undertook what was apparently an action to divert Syria’s attention from Turkey and to create the horror scenario of a two-front war just as Germany faced in two world wars. The IDF made a significant troop buildup on the strategic Golan Heights bordering the two countries, which, since Israel took it in the 1967 war, has been an area of no tension. The unfolding new phase of direct foreign military intervention by Turkey, supported de facto by Israel’s right-wing Netanyahu regime, curiously enough follows to the letter a scenario outlined by a prominent Washington neo-conservative Think Tank, The Brookings Institution. In their March 2012 strategy white paper, Saving Syria: Assessing Options for Regime Change, Brookings geo-political strategists laid forth a plan to misuse so-called humanitarian concern over civilian deaths, as in Libya in 2011, to justify an aggressive military intervention into Syria, something not done before this. Israel could posture forces on or near the Golan Heights and, in so doing, might divert regime forces from suppressing the opposition. This posture may conjure fears in the Assad regime of a multi-front war, particularly if Turkey is willing to do the same on its border and if the Syrian opposition is being fed a steady diet of arms and training. This seems to be precisely what is unfolding in the early days of October 2012. The authors of the Brookings report are tied to some of the more prominent neo-conservative warhawks behind the Bush-Cheney war on Iraq. Their sponsor, the Saban Center for Middle East Policy, includes current foreign policy advisers to Republican right-wing candidate Mitt Romney, the open favorite candidate of Israel’s Netanyahu. The Brookings Saban Center for Middle East Policy which issued the report, is the creation of a major donation from Haim Saban, an Israeli-American media billionaire who also owns the huge German Pro7 media giant. Haim Saban is open about his aim to promote specific Israeli interests with his philanthropy. The New York Times once called Saban, “a tireless cheerleader for Israel.” Saban told the same newspaper in an interview in 2004, "I'm a one-issue guy and my issue is Israel." The scholars at Saban as well as its board have a clear neo-conservative and Likud party bias. They include, past or present, Shlomo Yanai, former head of military planning, Israel Defense Forces; Martin Indyk, former US Ambassador to Israel and founder of the pro-Israel Washington Institute for Near East Policy (WINEP), a major Likud policy lobby in Washington. Visiting fellows have included Avi Dicter, former head of Israel’s Shin Bet; Yosef Kupperwasser, former Head, Research Department, Israeli Defense Force's Directorate of Military Intelligence. Resident scholars also include Bruce Riedel, a 30 year CIA Middle East expert and Obama Afghan adviser; Kenneth Pollack, another former CIA Middle East expert who was indicted in an Israel espionage scandal when he was a national security official with the Bush Administration. Why would Israel want to get rid of the “enemy she knows,” Bashar al-Assad, for a regime controlled by the Muslim Brotherhood? Then Israel’s security would seemingly be threatened by the emergence of hard-line Muslim Brotherhood regimes in Egypt to her south and Syria to her North, perhaps soon also in Jordan. The significant question to be asked at this point is what could bind Israel, Turkey, Qatar in a form of unholy alliance on the one side, and Assad’s Syria, Iran, Russia and China on the other side, in such deadly confrontation over the political future of Syria? One answer is energy geopolitics. Natural gas is rapidly becoming the “clean energy” of choice to replace coal and nuclear electric generation across the European Union, most especially since Germany’s decision to phase out nuclear after the Fukushima disaster. Gas is regarded as far more “environmentally friendly” in terms of its so-called “carbon footprint.” The only realistic way EU governments, from Germany to France to Italy to Spain, will be able to meet EU mandated CO2 reduction targets by 2020 is a major shift to burning gas instead of coal. Gas reduces CO2 emissions by 50-60% over coal. Given that the economic cost of using gas instead of wind or other alternative energy forms is dramatically lower, gas is rapidly becoming the energy of demand for the EU, the biggest emerging gas market in the world. Huge gas resource discoveries in Israel, in Qatar and in Syria combined with the emergence of the EU as the world’s potentially largest natural gas consumer, combine to create the seeds of the present geopolitical clash over the Assad regime. In July 2011, as the NATO and Gulf states’ destabilization operations against Assad in Syria were in full swing, the governments of Syria, Iran and Iraq signed an historic gas pipeline energy agreement which went largely unnoticed amid CNN reports of the Syrian unrest. The pipeline, envisioned to cost $10 billion and take three years to complete, would run from the Iranian Port Assalouyeh near the South Pars gas field in the Persian Gulf, to Damascus in Syria via Iraq territory. Iran ultimately plans then to extend the pipeline from Damascus to Lebanon’s Mediterranean port where it would be delivered to EU markets. Syria would buy Iranian gas along with a current Iraqi agreement to buy Iranian gas from Iran’s part of South Pars field. South Pars, whose gas reserves lie in a huge field that is divided between Qatar and Iran in the Gulf, is believed to be the world’s largest single gas field. De facto it would be a Shi’ite gas pipeline from Shi’ite Iran via Shi’ite-majority Iraq onto Shi’ite-friendly Alawite Al-Assad’s Syria. Adding to the geopolitical drama is the fact that the South Pars gas find lies smack in the middle of the territorial divide in the Persian Gulf between Shi’ite Iran and the Sunni Salafist Qatar. Qatar also just happens to be a command hub for the Pentagon’s US Central Command, headquarters of United States Air Forces Central, No. 83 Expeditionary Air Group RAF, and the 379th Air Expeditionary Wing of the USAF. In brief Qatar, in addition to owning and hosting the anti-Al-Assad TV station Al-Jazeera, which beams anti-Syria propaganda across the Arab world, Qatar is tightly linked to the US and NATO military presence in the Gulf. Qatar apparently has other plans with their share of the South Pars field than joining up with Iran, Syria and Iraq to pool efforts. Qatar has no interest in the success of the Iran-Iraq-Syria gas pipeline, which would be entirely independent of Qatar or Turkey transit routes to the opening EU markets. In fact it is doing everything possible to sabotage it, up to and including arming Syria’s rag-tag “opposition” fighters, many of them Jihadists sent in from other countries including Saudi Arabia, Pakistan and Libya. Further adding to Qatar’s determination to destroy the Syria-Iran-Iraq gas cooperation is the discovery in August 2011 by Syrian exploration companies of a huge new gas field in Qara near the border with Lebanon and near to the Russian-leased Naval port of Tarsus on the Syrian Mediterranean. Any export of Syrian or Iranian gas to the EU would go through the Russian-tied port of Tarsus. According to informed Algerian sources, the new Syrian gas discoveries, though the Damascus government is downplaying it, are believed to equal or exceed those of Qatar. As Asia Times’ knowledgeable analyst Pepe Escobar pointed out in a recent piece, Qatar’s scheme calls for export of its huge gas reserves via Jordan’s Gulf of Aqaba, a country where a Muslim Brotherhood threat to the dictatorship of the King is also threatening. The Emir of Qatar has apparently cut a deal with the Muslim Brotherhood in which he backs their international expansion in return for a pact of peace at home in Qatar. A Muslim Brotherhood regime in Jordan and also in Syria, backed by Qatar, would change the entire geopolitics of the world gas market suddenly and decisively in Qatar’s favor and to the disadvantage of Russia, Syria, Iran and Iraq. That would also be a staggering negative blow to China. Further complicating the entire picture is the recent discovery of huge offshore Israeli natural gas resources. The Tamar natural gas field off the coast of northern Israel is expected to begin yielding gas for Israel’s use in late 2012. 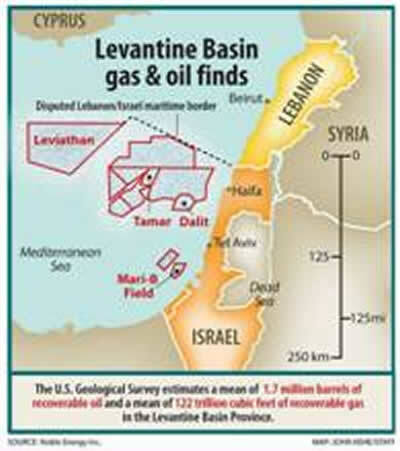 The game-changer was a dramatic discovery in late 2010 of an enormous natural gas field offshore of Israel in what geologists call the Levant or Levantine Basin. In October 2010 Israel discovered a massive “super-giant” gas field offshore in what it declares is its Exclusive Economic Zone (EEZ). The find is some 84 miles west of the Haifa port and three miles deep. They named it Leviathan after the Biblical sea monster. Three Israeli energy companies in cooperation with the Houston Texas Noble Energy announced initial estimates that the field contained 16 trillion cubic feet of gas—making it the world’s biggest deep-water gas find in a decade, adding more discredit to “peak oil” theories that the planet is about to see dramatic and permanent shortages of oil, gas and coal. To put the number in perspective, that one gas field, Leviathan, would hold enough reserves to supply Israel’s gas needs for 100 years. Energy self-sufficiency had eluded the state of Israel since its founding in 1948. Abundant oil and gas exploration had repeatedly been undertaken with meager result. Unlike its energy-rich Arab neighbors, Israel seemed out of luck. Then in 2009 Israel’s Texas exploration partner, Noble Energy, discovered the Tamar field in the Levantine Basin some 50 miles west of Israel’s port of Haifa with an estimated 8.3 tcf (trillion cubic feet) of highest quality natural gas. Tamar was the world’s largest gas discovery in 2009. At the time, total Israeli gas reserves were estimated at only 1.5 tcf. Government estimates were that Israel’s sole operating field, Yam Tethys, which supplies about 70 percent of the country’s natural gas, would be depleted within three years. Now Israel faces a strategic and very dangerous dilemma. Naturally Israel is none too excited to see al-Assad’s Syria, linked to Israel’s arch foe Iran and Iraq and Lebanon, out-compete an Israeli gas export to the EU markets. This could explain why Israel’s Netanyahu government has been messing inside Syria in the anti-al-Assad forces. However, a Muslim Brotherhood rule in Syria led by the organization around Mohammad Shaqfah would confront Israel with far more hostile neighbors now that the Muslim Brotherhood coup by Egypt’s President Mohamed Morsi has put a hostile regime on Israel’s southern border. It is no secret that there is enmity bordering on hate between Netanyahu and the Obama Administration. The Obama White House and US State Department openly back the Muslim Brotherhood regime changes in the Middle East. Hillary Clinton’s meeting with Turkey’s Davutoglu in August this year was reportedly aimed at pushing Turkey to escalate its military intervention into Syria, but without direct US support owing to US election politics of wanting to avoid involvement in a new Middle East debacle. State Department Deputy Chief of Staff Huma Abedin has been accused by several Republican Congress Representatives of ties to organizations controlled by the Muslim Brotherhood. Dalia Mogahed, Obama’s appointee to the Advisory Council on Faith-Based and Neighborhood Partnerships, also a member of the US advisory council of the Department of Homeland Security, is openly linked to the Muslim Brotherhood and an open foe of Israel as well as calling for the toppling of Syria’s al-Assad. Obama’s Washington definitely seems to be backing the Muslim Brotherhood horse in the race for control of the gas flows of the Middle East. Washington is walking a temporary tightrope hoping to weaken al-Assad fatally while not appearing directly involved. Russia for its part is playing a life and death game for the future of its most effective geopolitical lever—its role as the leading natural gas supplier to the EU. This year Russia’s state-owned Gazprom began delivery of Russian gas to northern Germany via Nord Stream gas pipeline under the Baltic Sea from a port near St. Petersburg. Strategically vital now for the future role of Russia as an EU gas supplier, is its ability to play a strategic role in exploiting the new-found gas reserves of its former Cold war client state, Syria. Moscow has long been engaged in promoting its South Stream gas pipeline into Europe as an alternative to the Washington Nabucco pipeline which was designed to leave Moscow out in the cold. Already Gazprom is the largest natural gas supplier to the EU. Gazprom with Nord Stream and other lines plans to increase its gas supply to Europe this year by 12% to 155 billion cubic meters. It now controls 25% of the total European gas market and aims to reach 30% with completion of South Stream and other projects. Rainer Seele, chairman of Germany’s Wintershall, the Gazprom partner in Nord Stream, suggested the geopolitical thinking behind the decision to join South Stream: "In the global race against Asian countries for raw materials, South Stream, like Nord Stream, will ensure access to energy resources which are vital to our economy." But rather than Asia, the real focus of South Stream lies to the West. 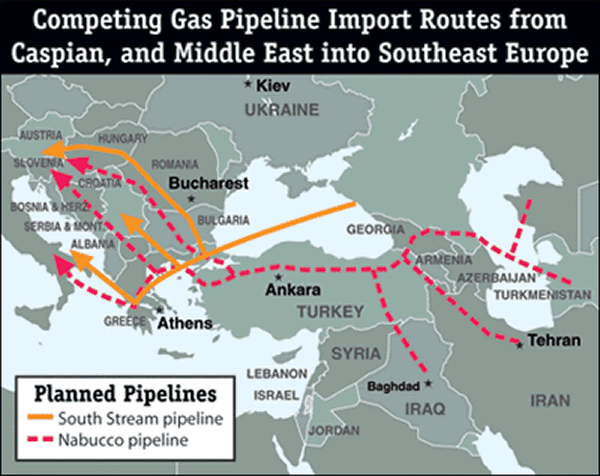 The ongoing battle between Russia’s South Stream and the Washington-backed Nabucco is intensely geopolitical. The winner will hold a major advantage in the future political terrain of Europe. Now a major new option of Syria as a major source for Russian-managed gas flows to the EU has emerged. If al-Assad survives, Russia will be in the position as savior to play a decisive role in developing and exploiting the Syrian gas. Israel, where Russia also has major cards to play, could theoretically shift to back a Russian-Syrian-Iraqi-Iran gas consortium were Israel and Iran to reach some modus vivendi on the nuclear and other issues, not impossible were the political constellation in Israel to change after the coming elections. Turkey, which is presently in a deep internal battle between Davutoglu and President Gül on the one side and Erdogan on the other, is dependent on Russia’s Gazprom for some 40% of gas to its industry. Were Davutoglu and his faction to lose, Turkey could play a far more constructive role in the region as transit country for Syrian and Iranian gas. The battle for the future control of Syria is at the heart of this enormous geopolitical war and tug of war. Its resolution will have enormous consequences for either world peace or endless war and conflict and slaughter. NATO member Turkey is playing with fire as is Qatar’s Emir, along with Israel’s Netanyahu and NATO members France and USA. Natural gas is the flammable ingredient that is fueling this insane scramble for energy in the region. F. William Engdahl is author of Myths, Lies and Oil Wars. He may be contacted through www.williamengdahl.com . *F. William Engdahl, author of Gods of Money: Wall Street and the Death of the American Century and Full Spectrum Dominance: Totalitarian Democracy in the New World Order (Third Millennium Press), may be reached via his website, www.engdahl.oilgeopolitics.net.